A Sony TV connected as external device via the HDMI port stop playing sound. The Sound (Playback Device) showed the device and was setup to be the default. The bars even showed sound playing but no actual sound. The enhancements were disabled. After struggling I decided to update the VIDEO driver. The XPS27 has an NVIDIA card for the monitor and and INTEL card for external devices. 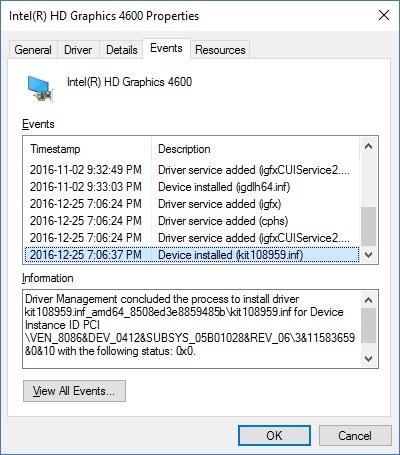 I wend to Device Manager / Display Adapters / Intel(R) HD Graphics 4600 and under Drivers I clicked Update Driver. After downloading and installing, the screens went blank and had to power cycle the PC but finally it appeared and worked again. If we are referring to an XPS 2720, my system still runs the igdlh64.inf install file and have had no problems so far. The video GPUs on the system are supposed to use the GPU which provides the necessary performance while using the least power. There is an Intel Display audio which probably is the HDMI output. But I am unclear on exactly what you are asking. Do you want to go back to the other driver or work on the sound?